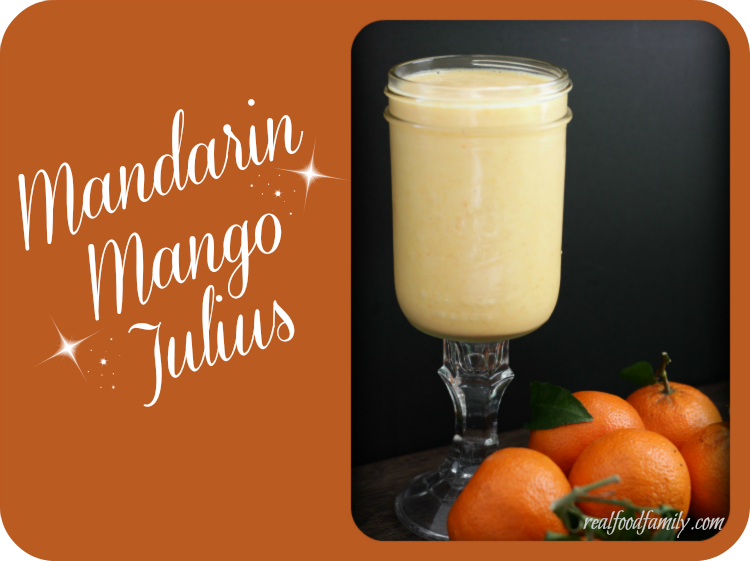 Do you remember growing up drinking Orange Julius? I don’t, actually. I just remember the store in the mall and that I was not a big fan because dairy made me a little sick. It’s probably a good thing, too, because I hear they made the drinks with a processed milk and egg powder or something…not the REAL way to make it (with eggs and real milk). As a “real foodie” now I can look at the Orange Julius with a different lens. It’s actually a fantastically nutrient-dense treat! I’m always looking for new ways to use my incredible eggs from my wonderful pastured chickens. I’m also always looking for ways to add more raw milk to the family’s diet. Enter the Orange Julius! 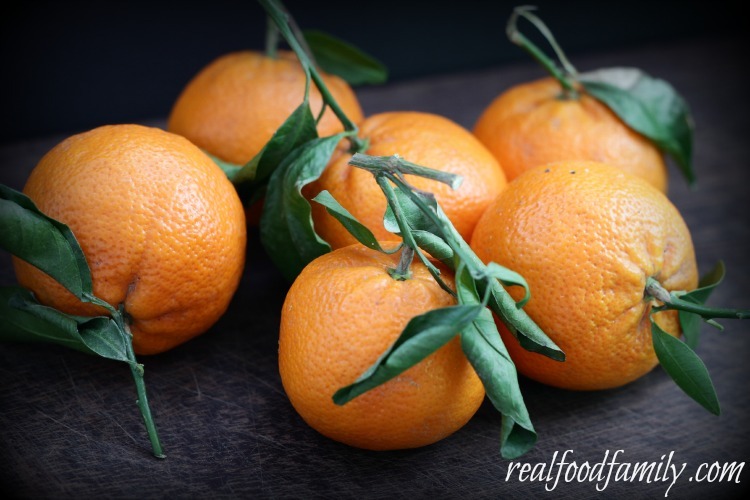 For a twist on the original recipe, we used delicious mandarin oranges that are making a brief appearance at our market right now. I also wanted to add a little extra frozen creaminess and sweet flavor, which comes from frozen mango chunks that I always have in my freezer for smoothies. I thought this combination was delicious. This recipe is a perfect base for any fruit smoothie enhanced with milk (or yogurt or kefir) and eggs, which I always make smoothies with. There is something special, though, about that classic “creamsicle” flavor, so start with this recipe then move on to your own creations. I use the whole fruit instead of juicing it first because of the benefits of eating the fiber and pectin with the fruit juice. This, however, will render your drink with a lot of pulp. If you can’t handle the thought of that, then blend and strain the oranges first, then continue with the recipe. I recommend using raw eggs and raw milk, but only if you have access to organic, pasture-raised chickens and dairy animals. Don’t eat raw eggs and milk unless you have an absolutely reliable source. Find a source of raw milk near you here. Place ingredients in a blender and blend for 1 minute, until smooth and creamy. Adjust ingredient amounts for desired texture and flavor. Enjoy immediately! This looks amazing! I used to LOVE Orange Julius at the mall. I haven’t thought about this in years. I am making this tomorrow as a Sunday treat! Thank you so much for sharing this recipe. Is it safe to eat raw egg yolks? Hey Tracy…Great question! I’m actually going to post some great links for you on this IN the post at the bottom so check it out! Roz, I definitely going to try this when I’m home, NO DOUBT there is no comparison to the one I just had yesterday in the mall with yours!! ps: the site looks AMAZING!!! GREAT WORK!!! Thank you Jacks!!! Remember when I was busy writing recipes during shows back in the day?? Haha! Well somehow this website is still kickin’.